Heat Shielding tape is intended to help you accommodate those specialty heat shielding needs! 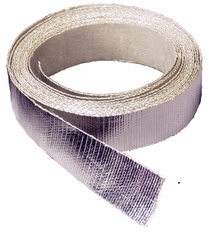 This heat shield tape reflects radiant heat away from wires, lines, cables, hoses, and more! It is an excellent way to insulate components without disassembly, or use it as a means to hold other thermal insulation in place. It is also excellent for quick "on the go" solution to heat problems. Our heat shield tape is a must have for your race track tool box! Durable cloth construction makes it longer lasting and more rugged than similar products. This reflective heat shield tape withstands 1100�F continuous radiant heat and 500�F of direct contact. The reflective heat shield tape cuts easily and installation is simple with our high temperature self adhesive backing.